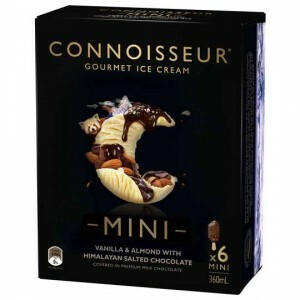 Connoisseur ice cream is such an indulgent and decadent ice cream range and these Himalayan Vanilla Almond mini ice creams are the perfect size for a treat. Connoisseur ice-creams are top of the market in my opinion and the himalayam vanilla almond is an amazing ice-cream that is worth every cent,so good! This is a great chocolate and the creaminess is just amazing. I don’t have them often as the cost is way over what I would call do able on a weekly budget but they are so nice they are a definite now and again treat. How would you rate Connoisseur Minis Ice Cream Himalayan Vanilla Almond?